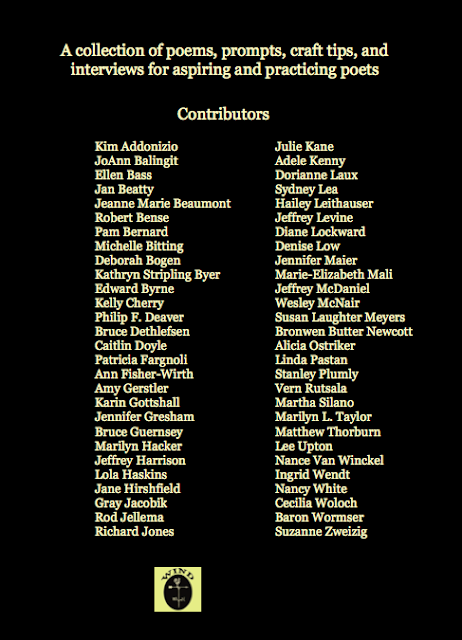 In a previous post about The Crafty Poet, I bragged about the list of poets who contributed Craft Tips, Q&As, and model poems for prompts. Now I want to brag about the poets who contributed the sample poems written to the prompts. Towards the end of putting the manuscript together, I sent out a call for submissions to all of the subscribers to my Poetry Newsletter. I created a website page with links to all of the past model poems and prompts. I subsequently invited others to join in. The book contains 27 model poems and prompts. Therefore, I needed 54 sample poems since I wanted two sample poems for each prompt. I wanted sample poems that would illustrate the various possibilities the prompts might suggest. Before I sent out the call, I was a bit worried that I might not get enough submissions. After all, some of the prompts were from newsletter issues that went back more than two years. 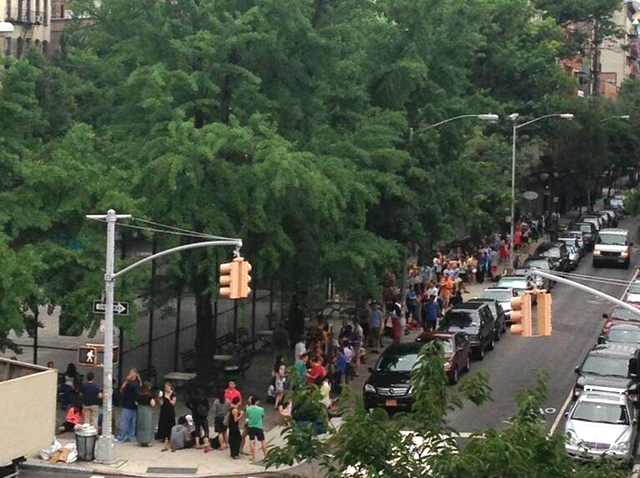 However, the spots filled amazingly and gratifyingly fast. I was thrilled to have all the spots filled within a few weeks. And I was thrilled with the quality of the poems I received. Sadly, there were many poems I had to turn away simply because the spots were already filled. I am happy to host today's Poetry Salon for Debra Bruce. I first met Debra on the Wompo Poetry Listserv. I then had the pleasure of meeting her in person at the West Chester Poetry Conference when we both served as panelists on a critical seminar exploring undervalued women poets. 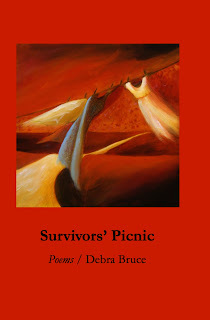 Debra's latest poetry collection is Survivors' Picnic, a collection filled with a variety of masterful form poems. Debra is also the author of three previous collections. She lives in Illinois and is a professor emeritus at Northeastern Illinois University. Debra is going to speak with us about Survivors' Picnic. DEB: I wrote the poems over a period of 15 years, along with many others that didn’t make it into my book. I’m an embarrassingly slow writer, and during these years I was busy teaching full-time and raising my son. Sometimes I wrote in direct response to the events of my life—mothering, breast cancer survival, and the end of a long marriage. Sometimes I would get an idea for a project-poem or series—a sequence about the six wives of Henry VIII, for example, which budded while I was teaching the court poets of the 16th century—especially Thomas Wyatt. I wrote two of the poems—two wives—but couldn’t find a way to do the other four. Sometimes I wrote poems just to exercise in a specific form, which I love to do, trying my hand at the ballade, villanelle, and a few pantoums. And as I read during these years, I fell under the spell of writers like Kay Ryan, whose example enabled me to write some of what I consider my strongest poems. Reading Ryan made me feel that I’d been given permission to bask in sounds—internal rhyme, assonance, and alliteration—something that had been frowned upon during the “plain style” decades. Ryan also showed me how to be more oblique rather than direct or explicit—a good lesson for someone who had studied with Anne Sexton back in '73, as I was just starting out. When I decided to put the manuscript together, I discovered poems that didn’t hold up, some that didn’t fit in, and a general repetition of sounds, images, and subjects. Several poems, even some that I’d published in good literary journals and that I personally liked, had to go. I’m glad I waited as long as I did because it enabled me to do this kind of winnowing, and I think the book is stronger for it. 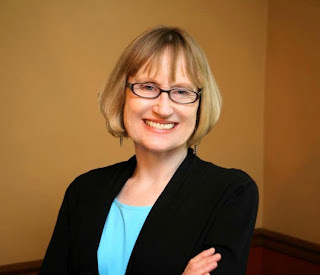 DEB: When I published my earlier books, first with the University of Arkansas Press, and then with Miami University, I had a helpful staff to design covers for me. This time, with Word Press (Word Tech Editions), an independent press, I was on my own. Clueless, I started asking other poets, and someone suggested I check out the collection at Woman Made Gallery in Chicago, a great venue for women poets as well as visual artists. Suzanne Keith Loechl had done a series of empty dresses on clotheslines set against deeply colored, swirling landscapes. I had looked at hundreds of images online, and when I found her work, that was it. I was thrilled when she agreed to let me use her image. As it turned out, this painting, “I Dreamed I Could Dance,” had become part of a website Suzanne created to honor friends she’d lost to breast cancer. No wonder it spoke to me. DEB: Titles have always been difficult for me. When I was married, my then-husband often came up with titles for individual poems and even books. My previous publishers had editors who had a knack for it, too. This time I was on my own. One of the poems in the book, “Annual Survivors’ Picnic,” felt like a “title poem,” but the wording wasn’t quite right for the whole collection—“annual” pins it down to a single event. Survivors’ Picnic sounded good, suggesting the shadow of fear that all survivors live with, and the deepening of life’s meaning and pleasure created by that shadow, as shade can deepen the beauty of color. DEB: I hope readers will take away a phrase or line that they can’t shake out of their heads—the music of it as much as what it says. And if a reader has experienced something I’ve written about, I hope she or he will feel that I’ve articulated the experience just right—nailed it. DEB: “Plunder” is a poem I would choose as a favorite because it makes music, which is of utmost importance to me. (Frost famously said, “All the fun’s in how you say a thing.) And it’s also a poem that can speak to many different experiences, though I had a specific experience in mind when I wrote it. I love poetry when it’s clear but not confined. Emily Dickinson has a powerful poem that starts, “I’ve dropped my Brain—My Soul is numb—,” which describes some kind of emotional or spiritual dark place or psychic freeze, describing it vividly and concretely without specifying what caused it. Let's listen now to Debra's wonderful reading of "Plunder." Please stay for the Reception. Help yourself to a glass of Malbec, some brie and cheddar on crackers, fresh fruit, and don't forget the Belgian chocolates. Before you leave, be sure to pick up a copy of Survivors' Picnic. 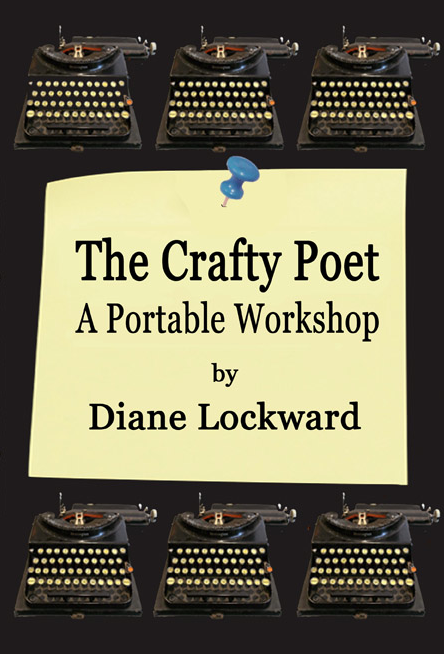 I am so very proud of the cast of poets who have contributed to my almost-here book, The Crafty Poet: A Portable Workshop. In fact, I think this is such an impressive list that my publisher and I decided to use their names on the book's back cover instead of blurbs. A total of fifty-six poets contributed the 27 Craft Tips, the 10 Poet on the Poem Q&As, and the 27 model poems that go with the prompts. Among these 56 poets are 13 former and current state Poets Laureate. 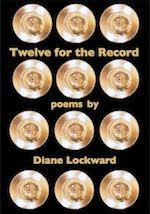 Now here's the contest: the first person to match up the 13 Poets Laureate with their respective states will win a free copy of the book. I'm going to switch comments to moderation, so post your answers in the Comments section. Once there's a winner, I'll post the correct answers and announce the winner. An additional 45 poets contributed the sample poems written in response to the prompts. This is also an impressive list—and not surprisingly, the poems they contributed are also impressive. I'll post those names another time. I love pastries. 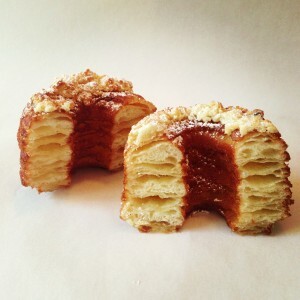 Last week my daughter told me about the newly invented Cronut. This delight was invented by the pastry chef at the Dominique Ansel Bakery on Spring St. in NYC. But its fans have spread far and wide. In fact, the pastry's fame has spread so far that some people refer to it as "a viral pastry." Half croissant, half doughnut, this pastry hybrid is filled with cream and topped with glaze. It is so delicate that it must be cut with a serrated knife. The bakery produces just one flavor per month. The owner recommends that if you really want one of these cronuts—and there's a 2 per person limit—you should be outside in line by 7:15 AM, prepared to wait for up to two hours. The bakery prepares only one flavor per month. Just invented in May, the cronut so far has come in only three flavors. The day after my daughter told me about the Cronut I heard two anchors on the morning news swooning over the confection, both saying it was the best they'd ever had. Now I deeply desire to have one myself. And for some reason, I'm obsessing about the cronut. I can't get it out of my head. That, hopefully, means that at some point a poem will emerge—just in case you were wondering what any of this has to do with poetry. But it's also occurred to me that the cronut is itself like one of those good poems that fuses together two unlikely components and is constructed in layers. 1. Write a poem about the Cronut. 2. Write a poem that fuses together two unlikely subjects. 3. Write a poem about your favorite pastry. Check out the Cronut Facebook page. Be prepared to drool. Check out the bakery page on Facebook. 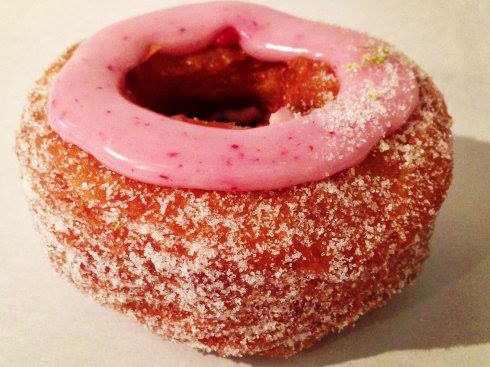 Here you'll find out all the history and controversy, yes, controversy, surrounding the cronut. 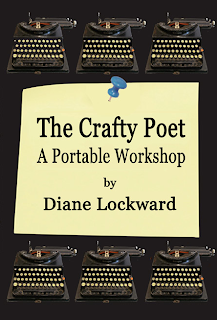 My book, The Crafty Poet: A Portable Workshop, is moving right along. The galleys have been proofed and returned. Page numbers have been added to the Contents. And the cover has been designed. Organizing this book was a huge challenge as it contains work from more than two years, work from this blog and from my Poetry Newsletter, work written by me and work written by other poets. In the Newsletter it doesn't matter if the poem and prompt coordinate with the Craft Tip, but for the book I needed to logically organize the material. I made a list of everything I planned to use in the book. Then I stared at that list for days/weeks until a plan began to form. That plan, of course, changed through multiple drafts, but once I had a plan, I knew I was going to get the job done. 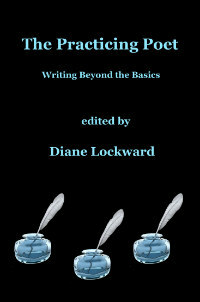 Because the book includes writing contributed by other poets, the big challenge in editing/polishing was to achieve consistency of style throughout the text. Some writers, for example, put commas around "too" when it means "also." Other writers do not. Some writers use the period key to create an ellipsis. Others use Option plus the semi-colon key. Either is correct but the look is slightly different. I wanted all the ellipses to look the same. (I have come to hate the ellipsis.) Stuff like that was sort of crazy-making, but I'm still here. And I'm thrilled with the book and can't wait to have it here. That should happen this summer. In the meantime, here's an advance view of the cover. I'm very happy with this. It feels just right for a craft book.